Saturday, December 15, 2012 – This morning Santa Claus arrived into Paxtang Borough on his sleigh and had breakfast with his favorite firemen. 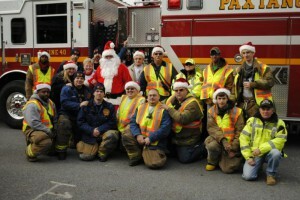 After that it was asked that he could make a special trip though Paxtang before Chistmas to visit all the Children, with that said the fire trucks were loaded up with crews and Santa’s Sleigh was loaded and traveled though the Borough to speading the word Santa is in Town! Everyone Santa stopped to see was on his good list even some furry friends. Just before Santa departed to head back to the North Pole he wished us all a Merry Christmas!! We would like to Thank our Members & Fire Police for making the Santa Run possible this year it always brings smiles to the children to see Santa in Paxtang as we enjoy doing this every year. Have a Safe & Merry Christmas!! 1. Draw up a floor plan of your house to ensure two ways out in the event of a fire and a staging area outside away from danger. 2. Install Smoke Alarms and test them monthly to make sure they are working properly. 3. Check all windows and doors to see if they open easily. 4. Make sure your house or building number is visible from the street. 5. In the event of a fire CALL 911 and never go back inside when your home is on fire, Stay outside til the Fire Department arrives. 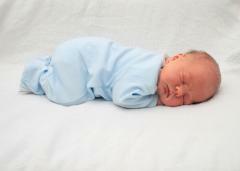 Please practice Home Fire Drills & Remember Have 2 Ways Out!! Monday, October 8, 2012 – Just a friendly reminder that October is Fire Prevention Month and Our Annual Open House here at Paxtang. This week we will visit with our Local School & Daycares to teach Children & Teachers the Safety and Prevention of a Fire if in the event one occurs at Home. So please join us this Wednesday October 10th from 6 p.m. – 9 p.m. at the Firehouse 3423 Derry St. for a fun and educational evening. Food, Fire Trucks on display, Live Fire Extinguisher Demonstrations and Much More. Please practice home fire drills, check smoke detector batteries and be “Rabbit Ready”!! Remember Two Ways Out!! Hope to see you at our Open House and Always Stay Safe!! 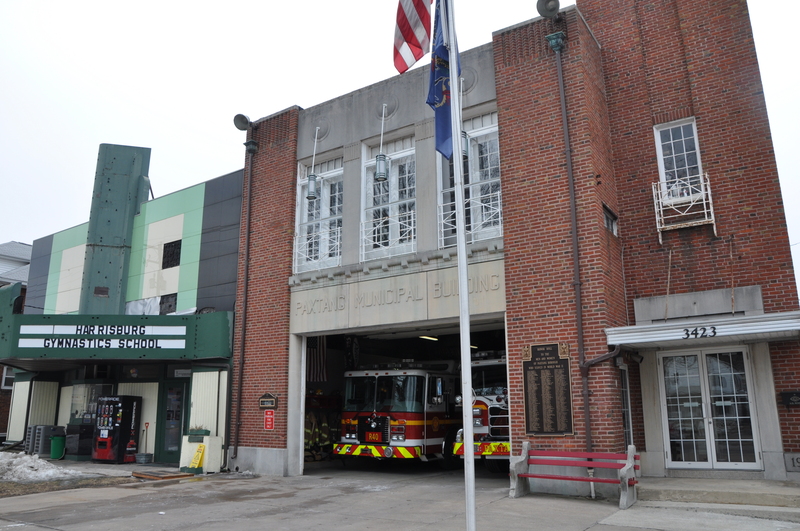 Saturday, October 6, 2012 – This evening Engine 40 was dispatched for a Vehicle Fire at 3715 Derry St. in the 40-2 Box, PD was the first to arrive with the vehicles engine compartment on fire. Engine 40 & Chief 40 (Zwigart) arrived and extinguished the fire quickly preventing the fire from going past the engine block. Control was marked in 1 min, The Crew remained on the scene with PD for 45 min. then cleared. 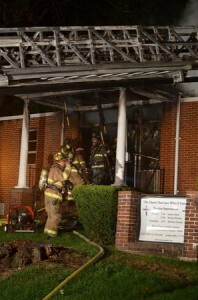 Saturday, September 29, 2012 – At 0545 Hrs Box 50-1 was dispatched for a Structure Fire at Turner Memorial Baptist Church on Watson St. The Rescue responded with a crew, Chief 50 (Brubacher) arrived to report a working one story brick building on fire. Rescue 40 quickly went to work with interior operations assisting Company 50 (Steelton) & Company 41 (Bressler) with extinguishement and overhaul of the fire. Crews remained on the scene for almost an hour. No injuries were reported. 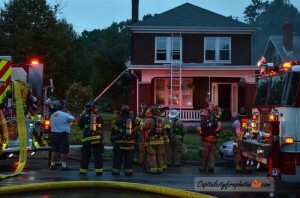 Photos Courtsey Of: Capital City Fire Photos. Wednesday, September 26, 2012 – This evening at 18:33 hrs Box 40-1 was dispatched for a Residential Structure Fire, with PD arriving confirming a working fire to the rear of the home. Chief 40 (Zwigart) arrived and took Command. Engine 40 laid line to the hydrant at 31st St & Derry. The Engine Crew went quickly to work discovering a fire in the kitchen within minutes the fire was knocked while Tower 32 (Progress) & Tower 3 (Harrisburg City) started clearing out the smoke in the home. Remaining Companies stood in manpower as needed. No injuries were reported and Crews remained on the scene for little over an hour.